​This tour is great for anyone with an interest in textiles, crafts and cultural sites including temples and villages, wanting to do a short but comprehensive tour of Laos. All workshops and classes are suitable for beginners. This tour has been designed to fit in with Singapore Airlines flights into Laos from Australia. Day 2 (Sunday) Your day starts at dawn when your local guide will take you to experience the sacred alms giving ritual that takes place every morning and sees hundreds of orange robed monks pass silently through town collecting alms from the locals. You will also take a walk through the fascinating morning market where the locals go to get their fresh produce each day. After breakfast your guide will then take you on a tour of Luang Prabangs sites including the oldest temple - Wat Visoun and the most beautiful temple of Wat XiengTong adorned in beautiful mosaics and stencilling. You finish your morning at the Royal Palace to get an insight into the history of the town, before enjoying a lunch of local delicacies. Days 3, 4 & 5 (Mon, Tues, Wed) Over these 3 days you will get to try your hand at a variety of textile crafts. 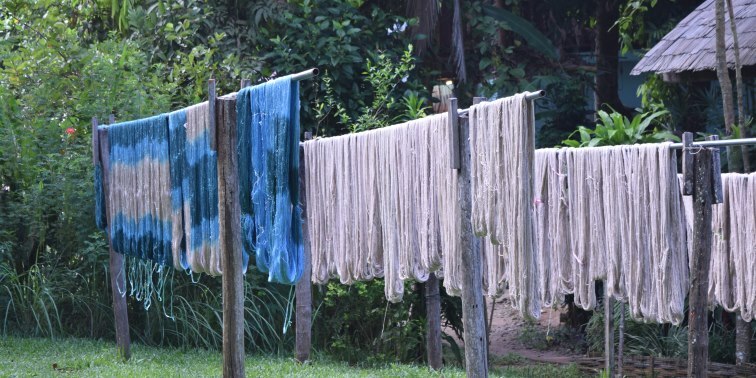 You will take a class in natural dyes where you collect your dye stuffs from the local garden and prepare the dye pots and spend an afternoon with a master weaver learning how to weave on a traditional silk floor loom. You will also try your hand at traditional Hmong batik and embroidery and take a tour of the Ock Pop Toc Living Crafts Centre and the Traditional Arts and Ethnology Centre. Days 5 & 6 (Thurs, Fri) These 2 days are totally free for you to soak in the atmosphere of beautiful Luang Prabang, relax or explore the shops and markets scattered through the town. If you are looking for more hands on classes theres opportunity to take a different embroidery class, or try your hand at Katu backstrap weaving, paper jewellery making, traditional Lao bamboo weaving or perhaps immerse yourself in the Lao cuisine by taking a cooking class. Day 10 (Monday). This morning you take a short flight to the charming capital city of Laos, Vientiane. On arrival your private guide and driver will collect you on arrival. You have lunch at a local restaurant before embarking on a tour of the city's major sites. First to the beautiful Wat Sisakat and Wat Prah Keo then onto the Patuxay monument and finishing your day at the iconic golden stupa of That Luang. Day 11 (Tuesday) This morning you take a drive out to visit the Huoey Hong Weaving centre where you spend the morning taking a tour of the centre and then having fun learning some shibori techniques and using traditional dyes to create a silk scarf. After lunch in town you take a drive out of town where you check out the quiet but fascinating Buddha park and gardens before dropping in to visit the fantastic Lao Disabled Women Development Centre to learn about the work they do in training women from across Laos. Day 12 (Wednesday) Today is a free day to explore the shopping and markets of Vientiane. Day 13 (Thursday) Your tour ends this morning after breakfast. Inclusions: 13 nights accommodation; daily breakfast; 8 lunches; private guided city tour in Vientiane and Luang Prabang; all classes and workshops detailed in itinerary; one way economy flight Luang Prabang/ Vientiane; private car and guide for tour into the mountains; arrival transfers; information pack.